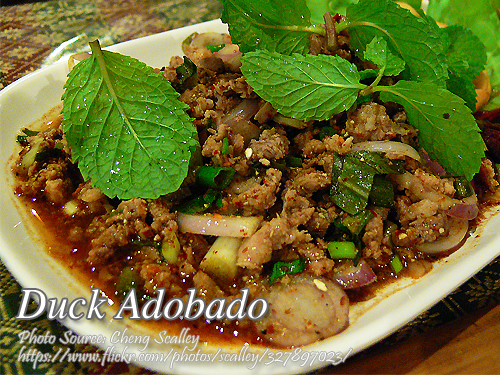 Adobado simply means “marinated” although this word is similar to “adobo”, they don’t mean the same thing. There are other variation of adobado but this recipe calls for duck meat as the main ingredient. The duck meat can be any kind of ducks whether wild ducks or domesticated ducks. Locally they are called “pato” and “itik” which are the most common edible ducks sold locally. To cook duck adobado; Saute garlic in oil. Add minced duck meat and saute until tender. Season with vinegar, patis, peppercorns and cayenne. Add sherry and simmer for 3 minutes. Season to taste. Set aside. Fry the rice with garlic. Arrange the fried rice and the duck meat in a platter. Garnish with toasted duck skin and cranberry sauce. Can any meat be used for this recipe? Hi Sandy, I think turkey and chicken can be used here in this recipe.